For the AV adept, there are few more aggravating stimuli in the world than bad-sounding audio. But there’s something even more irksome: unintelligible audio, especially when the message is exceedingly important (IE: What gate has my flight been moved to?). Luckily for everyone, loudspeaker manufacturers have been hard at work to make sure the sound coming from the ceilings of places from airports to boardrooms is not only clear as a bell, but pleasing to the ears of discerning audiophiles, as well. The following is a selection of the fruits of their work, all of which were on display at InfoComm 2017. The What: Harman Professional Solutions has launched the JBL LCT 81C/T ceiling tile loudspeaker, the latest addition to JBL’s lineup of in-ceiling loudspeakers. The What Else: Featuring high sensitivity and voice intelligibility, the LCT 81C/T utilizes an 8-inch dual-cone driver and a 1-inch voice coil to provide quality sound in an easy-to-install design. At just 4 inches, its low-profile depth allows the LCT 81C/T to be installed in places that other ceiling loudspeakers can’t fit, such as older buildings with low ceiling heights or ceiling spaces that are obstructed by pipes or ducts. The What: The high-performance Community D6 is a coaxial loudspeaker with a real compression driver concentrically arranged so that the upper frequencies emerge through the center of the low-frequency driver’s magnetic structure and cone via a tapered Tru-Phase high-frequency waveguide. The What Else: This special construction provides consistent, wide dispersion up to 16kHz, all but eliminating high-frequency narrowing. Further pattern improvement is achieved by precisely mounting the LF driver (and its concentric HF driver) centered in the baffle, as contrasted to the offset designs used by others. The What: SoundTube Entertainment’s IPD4-CM62-BGM is an in-ceiling speaker for use on the popular Dante networking platform. The What Else: The IPD-CM62-BGM is a 6.5-inch coaxial speaker with integrated backcan and SoundTube’s SpeedWing mounting system for fast installation. BroadBeam Ring technology on both the IPD4-CM62-BGM and the standard CM62-BGM units ensures broad dispersion of high frequencies and good intelligibility, even well off-axis. The low latency in Soundtube IPD speakers improves synchronization with video systems. The What: The Yamaha VXS1ML compact speaker made its debut at InfoComm 2017. The product and a comprehensive set of installation accessories join the Yamaha Commercial Audio Solutions (CIS) product line. The What Else: The VXS1ML features a newly developed 1.5-inch full-range driver unit that, thanks to a neodymium magnet and other refinements, delivers sonic quality that belies its size. It offers wide, 170-degree horizontal and vertical dispersion, so large spaces can be efficiently served by a relatively small number of speakers. The What: Lowell Manufacturing Company has released an upgraded design to its LT/SM Series of (1x2 or 2x2) lay-in tile ceiling speakers. The What Else: Each of the new LT/SM assemblies features two 8-inch, 15-watt dual-cone drivers—one to fire down for music/paging, one to fire up for sound masking—and factory-wired 70V transformers. Taps are selected by externally accessible rotary control knobs, while removable plates improve wiring. Two models include an optional volume control adjustment knob for the sound-masking driver. The What: AcousticDesign ceiling loudspeakers from QSC offer a variety of models specifically tailored for demands of higher fidelity applications. The What Else: The AD-C4T and AD-C6T also offer a 95mm, low-profile design that enables installation in standard timber frames, making it easier to qualify without sacrificing sonic characteristics. The AD-C4T and AD-C4T-LP are two-way with 120-degree conical coverage, while the AD-C6T and AD-C6T-LP are two-way with 105-degree conical coverage. The What: Bose Professional EdgeMax in-ceiling loudspeakers feature proprietary Bose PhaseGuide technology, which is designed to provide room-filling coverage while improving overall sound quality. The What Else: EdgeMax in-ceiling premium loudspeakers are available with two different horizontal coverage patterns. 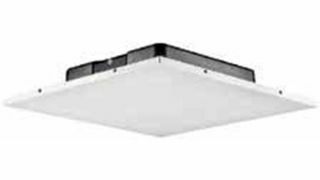 EdgeMax EM90 models provide nominal 90-degree horizontal coverage and are intended for in-ceiling mounting near room corners. EdgeMax EM180 models provide nominal 180-degree horizontal coverage and are intended for in-ceiling mounting near wall boundaries centered along target coverage zones. The What: The Bogen NQ-S1810CT is a VoIP duplex ceiling speaker designed for the company’s new Nyquist software-centric IP communications and audio distribution platform. The What Else: Its full-range, 8-inch speaker and built-in 10-watt Class D power amplifier provide high audio quality, and an integrated MEMS microphone delivers enhanced talkback fidelity. Volume is controlled using the browser-based Nyquist GUI that can be accessed via desktop and laptop computers, as well as smartphones and tablets from anywhere in the connected world, 24/7. The What: The CIS300 and CIS400 are compact, two-way, flush-mount loudspeaker assemblies designed for fixed installations into typical ceiling plenum spaces. The What Else: Both models are supplied with an integral 70/100-volt line transformer rated to a maximum of 30 watts. Power is adjustable from a recessed rotary switch on the front bezel, and allows selection of 30-, 15-, 7.5-, and 3.7-watt taps. A second recessed rotary switch is provided to engage a 16-ohm tap for use with low-impedance amplifiers, or a 150Hz high-pass filter. The What: Kramer has launched the Galil C Series of closed-back, two-way ceiling speakers. The What Else: Galil C speakers are designed for easy implementation, with simple dog-ear installation. They allow for installation flexibility, as integrators can install a few speakers in a boardroom with 8-ohm operation, or an array of speakers in a hotel lobby using 70- or 100-volt tapping. The line comes with aluminum grilles that remain rust-free in humid environments such as workout facilities, indoor pools, and saunas. The What: TOA’s F-122CU2 is a line of in-ceiling back-can speakers that are UL Listed for fire protection, general purpose signaling, and air handling spaces, as well as by the California State Fire Marshall. The What Else: The F-122CU2 is designed for optimum sound quality with a 5-inch full-range driver and ported bass-reflex design. A special diffuser provides wide-dispersion at 180 degrees with smooth, off-axis coverage. The What: The Saros Integrator ICI6T model is a two-way in-ceiling speaker featuring a 6.5 inch woofer and 0.75-inch dome tweeter. The What Else: It is designed to enable quick installation and reliable performance in restaurants, retail spaces, convention facilities, airports, and office buildings. A built-in 30-watt multi-tap transformer allows for use with 70- and 100-volt distributed speaker systems. Mounting the speaker is facilitated using toggle clamps integrated into the enclosure. The What: Electro-Voice has introduced its new Premium Ceiling (PC) Speakers, the latest members of its EVID (EV Innovative Design) family of small-format installed audio products. The What Else: The PC6.2 (6.5-inch two-way) and PC8.2 (8-inch two-way) both feature a dedicated compression driver for enhanced high-frequency performance and coverage control. Simplified wiring and innovative new integrated mounting hardware allow for quicker installation into a wide range of ceiling cavities and construction formats. The What: Designed to offer high-performance features, the Ceiling Series brings Martin Audio engineering to the installation market. The What Else: Consisting of the C4.8T, C6.8T, and C8.1T, the Ceiling Series provides solutions for a wide range of installation scenarios. Each loudspeaker is housed in a steel backcan and has been designed in accordance with IEC60849/EN60849 and are UL2043 and UL1480 certified. With a 16-ohm impedance, the use of multiple units in low-impedance systems is simplified. They are also fitted with a high-specification transformer enabling power selection for either 70V or 100V operation via a front-mounted rotary switch. The What: Audio Spotlight directional speakers by Holosonics, such as the flagship AS-24i deliver sound in a tight, narrow beam, with levels dropping by more than 90 percent just a single step away. The What Else: The AS-24i has a built-in amplifier/processor, microSD player, and both balanced and unbalanced line level audio inputs standard, and is equipped with a VESA100 mounting pattern for worldwide compatibility. Available options include Bluetooth wireless technology, motion sensor/trigger, and custom surface printing.